Sometimes we have such a variety of choice that it becomes overwhelming, and we feel this most when we want to choose the best baby products for our kids. What does my baby need? If I can use it, why can’t my baby? The list is endless. But worry not parents, we’ve gathered 5 tips to help you choose safe baby products that will keep your baby happy and healthy - from skin care to hair care! 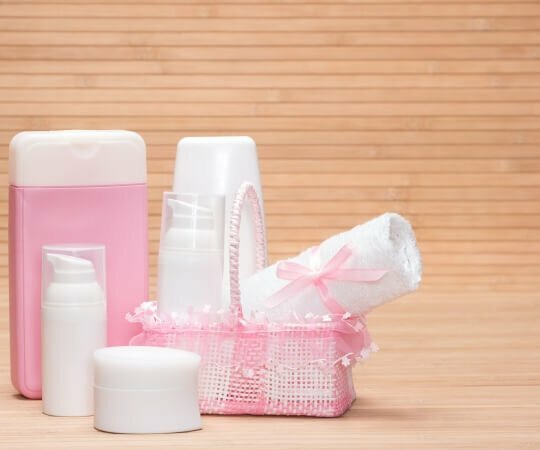 Knowing which substances are used in your baby’s shampoos and lotions is a great way to feel more confident about your choices. All Johnson’s® baby products undergo extensive research and testing while cooperating with moms every step of the way. Every baby product must pass a five-level safety process before it’s available for your baby. Find out more about the ingredients we use here. Essential oils, for example, don’t pass Johnson and Johnson’s safety requirements. They contain allergens which could irritate baby skin, so stay clear of them! Your baby’s skin is delicate – much more delicate than an adult’s skin. This is why it’s important to use products made just for babies, because they’re carefully developed for your baby. You know how some creams tell you to apply them first on a small area and then check if there are any changes after 24 hours? Try doing that with your baby, too. Instead of using a newly purchased baby product all over your baby’s body, try testing it out on a small visible area of their body first. See if there is an allergic reaction and if there isn’t any within 24 hours, you should be safe to go. If you do notice any rashes, dryness or redness, you should consult your pediatrician to find out the underlying problem as soon as possible. There are some natural remedies and mixes we can try at home to make face and body washes. Although natural may sound good, all-natural baby care products may do more harm than good for your baby. This is because baby skin is very thin, so, for example, citrus fruits such as oranges (which can be used in some face washes) can irritate your baby’s skin and cause allergies. It is essential to use products that have been tested rigorously. ‘Natural’ products have shorter shelf lives, and by the time you buy them, they may have already been there for months before they’re opened – making them high in risk. Preservatives do just as their name suggests: they preserve the product so that it can last longer and cause no harm to your baby. While the word may sound scary to some, it is an addition that ensures your products stay fresh. Babies can be splashers. No matter how careful you try to be while giving them a shower, you can’t guarantee that no shampoo would go near their eye. For your baby’s safety, use a NO MORE TEARS® formula shampoo. Shampoos can irritate the eye if they ever come in contact, but with the NO MORE TEARS® formula, your baby’s eyes are safe, and will hurt no more than if they came across a sprinkle of water. Developed and introduced in 1953, the NO MORE TEARS® formula was the first specially developed product to ever be so mild to a baby’s eyes like pure water. Every product with the NO MORE TEARS® trademark is evaluated for safety from harsh ingredients, clinical testing (including eye irritations by ophthalmologists) and lastly, undergoes a thorough medical review. Every ingredient in Johnson’s® baby products passes a five-level assurance process. Before the baby care products are introduced in the market, we source safe products and make toxicology assessments. Find out more about our medical professionals, volunteers, our safety process and BEST FOR BABY™ standard here. Your baby needs to remain moisturized as baby’s skin tends to lose moisture faster than adults’. Choosing the right baby products prevents your baby from experiencing any dryness or irritation from their surrounding environment. Make sure you tick all the boxes before choosing a baby product, whether it be shampoos, lotions, or any other products you use for your baby! Choosing the best baby products for our child not only makes us feel confident in our choices, but it keeps our baby happy and confident too!